“Tell her the story about the banker.” I am sitting in the kitchen of Steve Boss, co-host of the cooking show Great Taste on KRUU 100.1 FM, and talking with Gisella Isidori, an Italian chef and food consultant. Steve wants to make sure that Gisella is telling me all the really cool details about herself. It is Steve who tells me that Gisella knew Carlo Petrini before he founded the Slow Food Movement, that she knew all the people who started the organic movement back in the day, including the people behind Eden Foods and John Mackey, one of the founders of Whole Foods. What becomes clear as Gisella shares her stories is that her passion for food plays a central role in all of them, starting with the story of the banker she encountered in an elevator. The banker, intrigued by her shopping bag full of vegetables that she planned to use for soup, struck up a conversation with her and ended up extending a much-needed line of credit that helped Gisella and her husband establish their fashion import business in New York back in the 1960s. In return, Gisella and her husband cooked Italian food for the banker and his wife once a week. Since there were no hotel rooms available and travel was not yet possible, one of the agents, Leisa Aras, took Gisella into her home. Gisella responded to her rescuer’s generosity by preparing home-cooked authentic Italian meals for Leisa and her children every day she spent with them. Once again, food was the bridge, building new connections and making sure that no good deed goes unrewarded. One of those connections built by food is with radio host Steve Boss. Steve and Gisella were introduced by a shared friend in the food business several years ago and now seem to mutually delight in each other’s company. 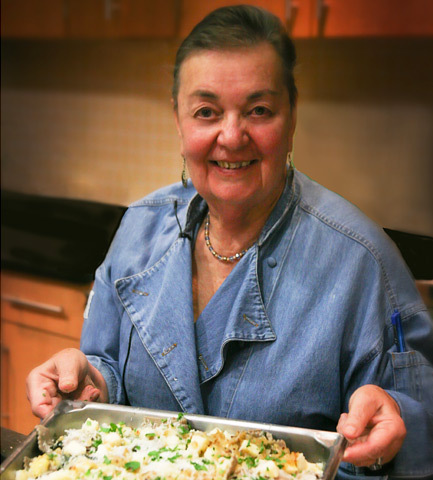 Having arrived safely by train from New York, Gisella was staying with Steve and his wife in Fairfield, where she gave a gnocchi-making demonstration at the At Home Store, made pasta with school kids, worked with culinary students at Indian Hills Community College, and appeared on a special taping of Great Taste, which Steve co-hosts with Kathy DuBois. “The show is basically designed to promote the idea that it’s really fun to cook your own food, and it’s really great to know where your food comes from and to develop relationships with the people who are growing it or producing it.” Steve acknowledges that it might seem strange to cook live on the radio rather than on a visual medium like television, but he says that listeners just need to use their imagination. This, he believes, is what makes radio so magical and allows him to connect with people and share his love of food. One of the most common food connections that we all share is what we eat during holiday celebrations. In spite of their common love of food, especially authentic Italian food, Steve and Gisella come from very different holiday food backgrounds. For Steve’s family, the big December holiday was Chanukah and the must-serve food was potato latkes topped with applesauce and sour cream. According to Steve, really good latkes require four things: grate the potatoes yourself on a box grater for the perfect texture, leave out the eggs, use good oil to fry them, and serve them with homemade applesauce. Having grown up in Valtellina and later Milan in northern Italy, Christmas Eve and Christmas Day are the big holidays for Gisella. Italy has 20 different regions and as many different ways of celebrating the holiday with food. Besides panettone, Gisella says that the other must-have for Italians at the Christmas Day meal is a really good soup along with appetizers and several different kinds of meat and fish. Gisella makes gnocchi at the At Home Store. The difference in traditional foods according to region and how those foods change when they are prepared in a different place with locally available ingredients is something that Gisella seems to know a great deal about. As Steve will point out later in the week during the Great Taste taping, Gisella’s cooking philosophy is to always adjust her dishes to the best local ingredients available. During our interview, Gisella reminds me that two of the most “Italian” foods—noodles and tomatoes—did not exist in Italy until Marco Polo and Christopher Columbus brought them from Asia and the Americas respectively. From the first Italians to make pasta, to the early Italian-Americans who developed a cuisine that modern Italians find unrecognizable, to the Mexican food made in Italy with Italian parsley instead of cilantro, people have been adapting their cuisines to the ingredients at hand for as long as they have been cooking. And that’s just fine with Gisella. Click these links for Gisella’s recipes for Panettone Farcito and the traditional Italian Christmas soup passatelli, and Steve Boss’s potato latkes with homemade applesauce.